Continuous glucose monitoring (CGM) technology can continuously monitor the glucose concentration in subcutaneous interstitial fluid through a glucose sensor, providing a glycemic profile throughout the day. CGM is able to detect occult hyperglycemia and hypoglycemia that cannot easily be detected by traditional glucose monitoring methods. In addition, CGM facilitates the understanding of the influence of diet, exercise, drugs, and other factors on blood glucose, prompting patients to establish a healthy lifestyle and improve patients’ adherence. Therefore, it plays an irreplaceable role in glucose monitoring for diabetes patients. 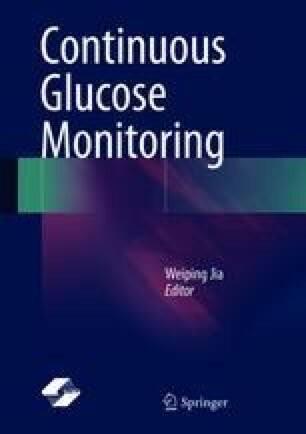 Since CGM system detects glucose concentration through glucose sensors, the development of CGM is largely dependent on the evolution of glucose sensors. In 1999, MiniMed Inc. introduced the world’s first subcutaneously implanted glucose sensor and since then has initiated the clinical application of CGM. This chapter will discuss the development of CGM and the technical characteristics of common CGM equipment on the market.